Today we took our only long-distance train that was not run by RENFE. 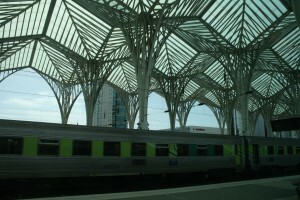 The reason is that they operate in Spain and this was the only long-distance train we took out of Spain. 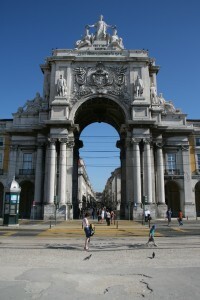 On the way out of Lisbon we went through the Estacao de Oriente making it the last of the many times going through there. The quality of the CP train was decent but it really reinforced the quality that the RENFE has. 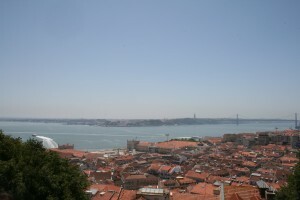 We ended up being in Lisbon on the night of the biggest party of the year, The Festival of Santo Antonio. After having some really good homemade pizza at the hostel we headed out to the party. Many streets were shut down with people filling where cars and the trolleys we were going to take to the castle are usually. We went and spent time wandering around and had some cotton candy and other random snacks. We arrived in the Estacao de Oriente from Merida and this was the first visit to the building. The building definitely has an interesting look but once you start to use the building you realize that it does not work. The Castle sits atop the highest hill overlooking the center of the city. I just started to understand some Spanish! Just when I was starting to understand some Spanish we go to Portugal. We got on a bus that took us from Merida, Spain to Lisbon, Portugal. Not once crossing the border between the two countries did we have to show our passport because in the European Union you are free to move between countries unlike earlier where we would have had to go through a customs checkpoint. 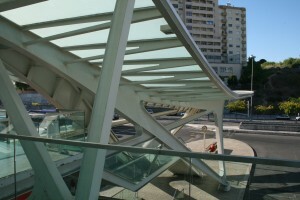 We then arrived in Lisbon and I once again was totally without any clue as to communicating. The one nice part was that more people in Portugal spoke English than in Spain. 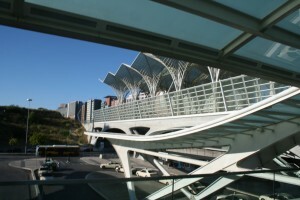 We came into the Santiago Calatrava designed Estacao de Oriente.